First we need to gather our berries and remove any unpalatable bits. My life was made a thousand times easier by my lovely Christmas present: a blender. Whoo! Now I can stop complaining and avoiding recipes that took far too long. This baby is my new best friend. This next step is a matter of preference, and for some berries purely aesthetics. But I like to sieve the seeds out through a fine mesh sieve. If you don't mind the look or the texture, then don't worry about it. Next we heat the cream on the stove, then add the chocolate and then the egg yolks. 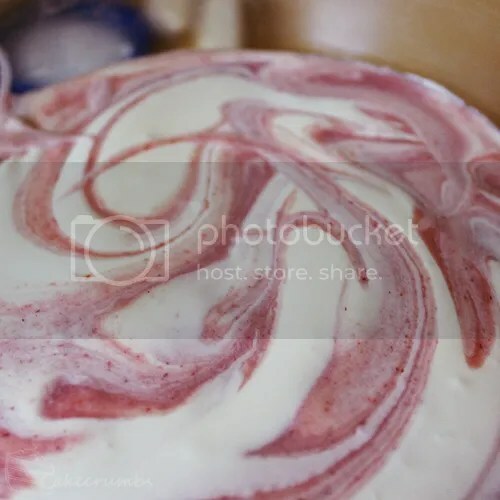 After it cools a little, pour the whole lot into your berry mixture and stir to combine. Next we beat the cream and the egg whites to soft peaks. This stage is really important, so take your time and make sure you get it right. 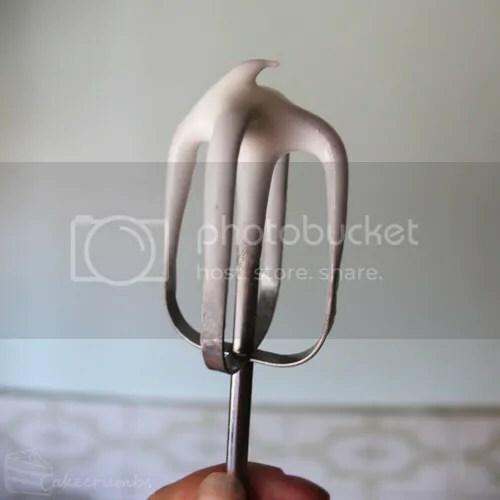 Over-whipping either will make it impossible to fold through the berry mixture without deflating, and will ruin the set of your parfait. 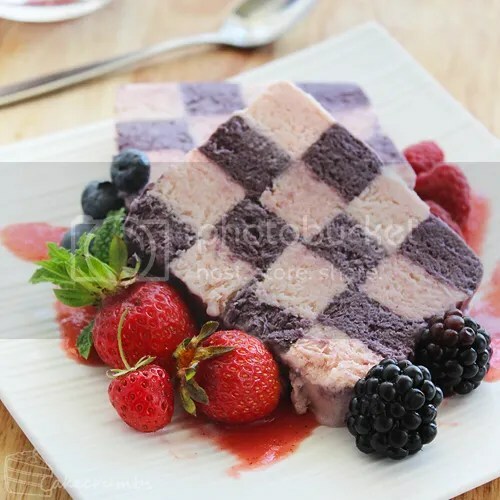 It will melt as soon as it is out of the freezer, making it impossible to get a checkered pattern. I've made this mistake before with one of my layers and ended up serving the dessert in a tumbler. I had cubes of one flavour of frozen parfait swimming through the melty other flavour: tastes fine, but ain't pretty. You want it so the little peaks are firm enough to stand up, but will still fold over on itself. That's characteristic of a perfect soft peak. Once that's done we pour it into a lamington tin and leave it to set. 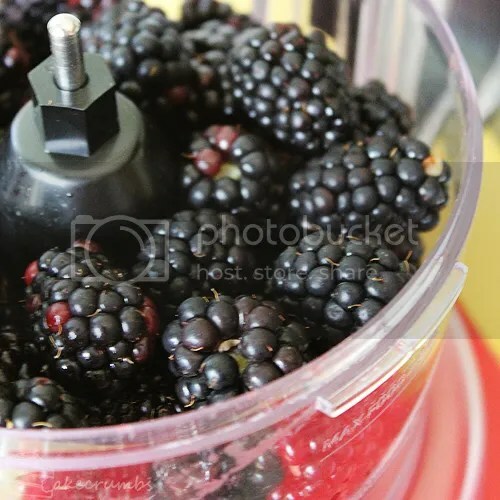 Once your bottom layer is set, you can grab your next lot of berries and repeat the process. I didn't catch any photos of the next process because Aussie summer + no air-con means working fast is an absolute must. But after a bunch of slicing, stacking, brushing and offering my first born to the goddess Ambrosia, I managed to end up with something that wasn't a puddle. If heat is also an issue for you, working on top of a marble/granite tile (or even a large metal tray) that's been in the freezer for a little while helps. I served these with a plethora of berries hanging out in my freezer: strawberries, blackberries, raspberries and blueberries. We rejoiced our berry heaven. One of my own home grown berries even got to star in the show. The last few years I've been trying to grow as much herbs and fruit and veggies as I can in my yard (a feat that it heavily orientated around finding space my husky won't dig up). This summer I took home a strawberry plant. It's still growing up so my yield was tiny, but the little tiny strawberry in the foreground was the first berry to come from my garden.It was also the most flavoursome berry I'd eaten in my life. 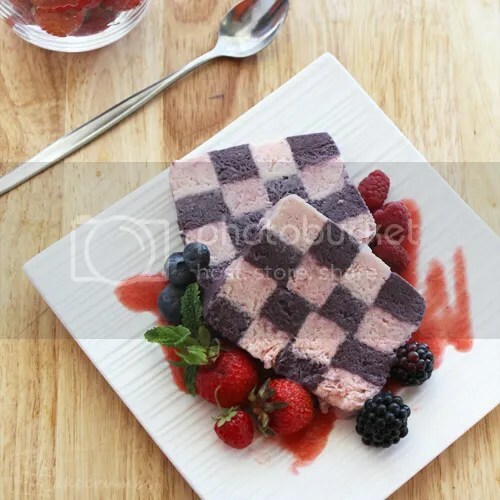 The parfait is served with a berry sauce of your choice. I chose strawberry because they're not only my favourite, but I had so many to burn. This recipe will provide more than you will need, but it stores really well in the fridge and can be used for any dessert you like. You could even use it to top off a simple fruit salad, icecream, or to dress up a smoothie like this one. What are we waiting for? Let's dig in! 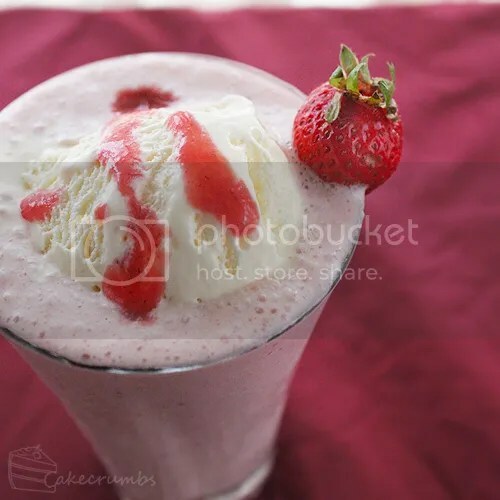 If fresh berries are out of season or budget, feel free to substitute with frozen berries. 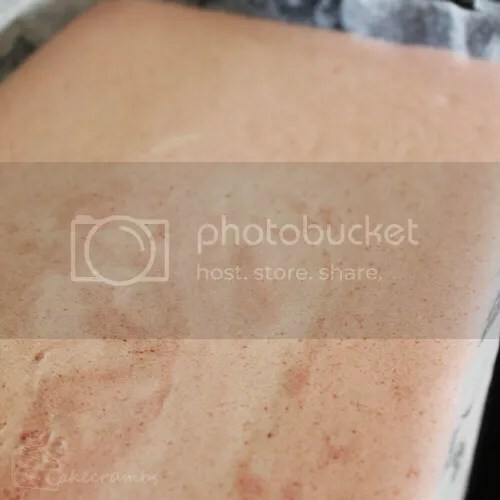 Line the base and sides of a lamington tin (approx 28x18cm) with plastic wrap or baking paper. 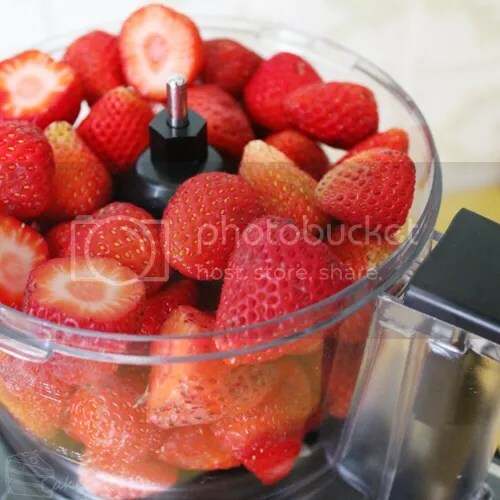 For the strawberry layer: Process berries until smooth. Pass mixture through a fine mesh sieve to remove seeds if desired. Stir in caster sugar. 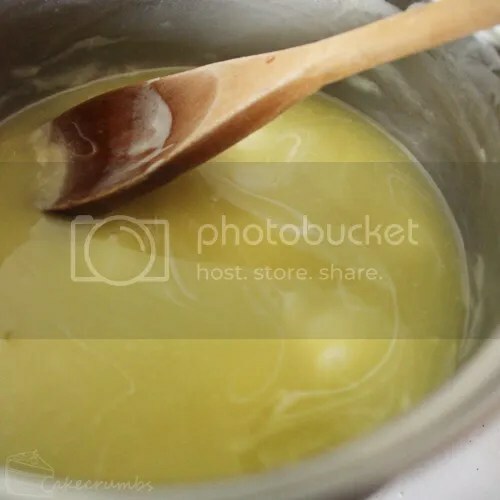 Heat cream in a small saucepan over medium heat, stirring. Once cream has begun to boil, remove from heat and add the chocolate. Stir until chocolate has melted. Allow to cool a little, then stir in the egg yolks. 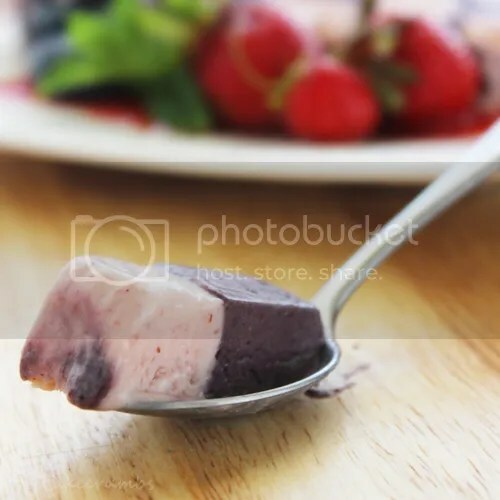 Combine berry mixture and chocolate mixture in a medium bowl. 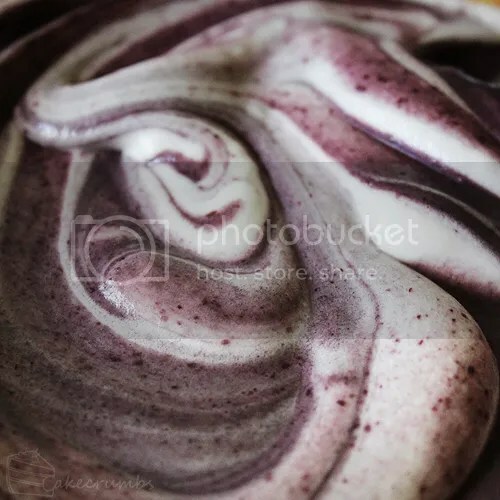 Whip egg whites to soft peaks, then fold through the berry mixture a third at a time. Ensure this is done gently to avoid deflating the egg whites. Pour mixture into tin, then place in the freezer until firm. For the blackberry layer: Once strawberry layer is set, repeat steps 2-6 using the blackberries. 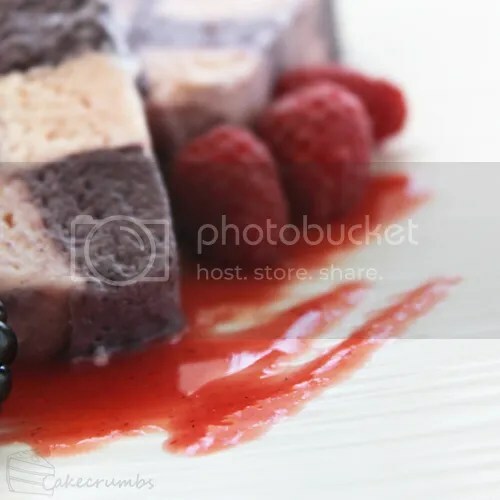 Pour blackberry mixture on top of strawberry layer in the tin and allow to set, preferably overnight. 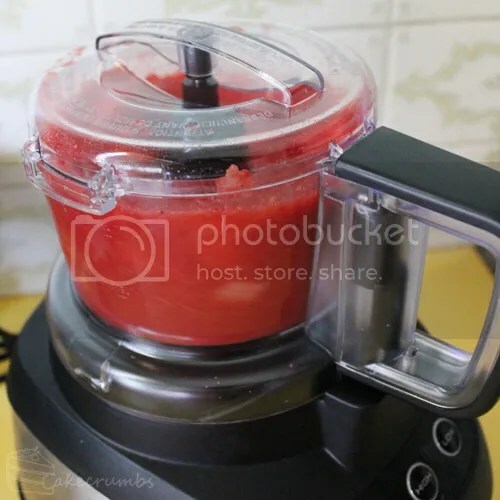 For the berry sauce: Process strawberries until smooth. 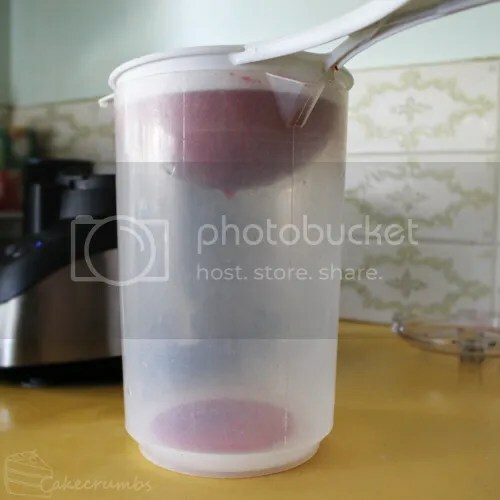 Strain through a fine mesh sieve to remove seeds, then transfer to a bowl or Tupperware container. Stir in caster sugar, and enough water to achieve desired consistency (I like the thick consistency the sauce has naturally so I do not add water). Store in the fridge until required. To assemble: Lightly beat egg white. 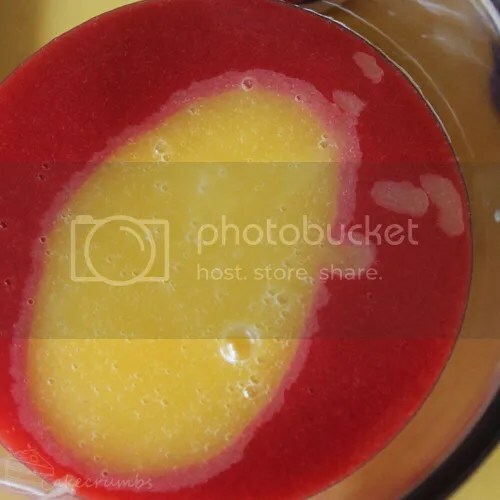 Remove parfait from the freezer and turn onto a cool work surface. 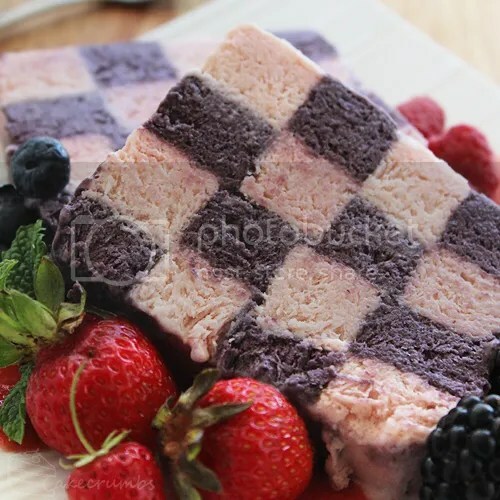 Using a ruler to measure and a long, sharp knife, cut the parfait lengthways in half. Brush the surface of one bar with egg white, then place the second bar on top so that the colours are alternating horizontally. If parfait is beginning to melt, return to the freezer for a few moments. Cut the parfait in half lengthways, and then cut those halves in half again. Turn two of the slices upside down: brush the sides with egg white, then joint the lengths together so that the colours of adjacent lengths are facing opposite directions. You will have a long bar with a chequered pattern running through it. Wrap the parfait tightly in plastic wrap; press the bars together gently, but firmly, to ensure they have joined and there are no gaps. Place it back in the pan or suitable sized container and return to the freezer until ready to serve. To serve: Spoon some of the berry sauce onto a serving plate. 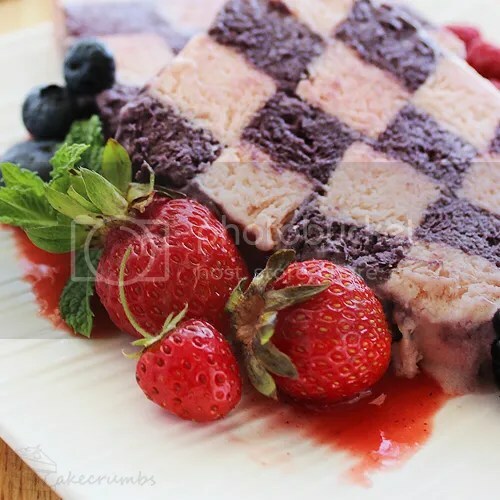 Remove the parfait from the freezer and slice acrossways (as you would a loaf of bread). Assemble onto serving platter. Serve with fresh berries. I love this dessert. Always looking forward to the next time you make it. Lovely and refreshing.